If you’re used to carrying your own gear in a backpack, you’ll be amazed at the apparent luxury of a trekking camp in Nepal. Although you’ll be sleeping on foam mattresses placed on the ground, you’ll be assigned a roomy A-frame or dome tent that comfortably accommodates two people and their gear. Meals are served family-style on a table as you sit in a chair inside a dining tent. The camp staff have their own tents near the kitchen facilities and kitchen boys race back and forth to the dining tent acting as waiters. If there’s no permanent toilet near the camp, the staff dig a hole and set up a toilet tent. It is a bit pretentious to call some village establishments hotels, but the most common word in Nepali for restaurant or eating place is hotel. 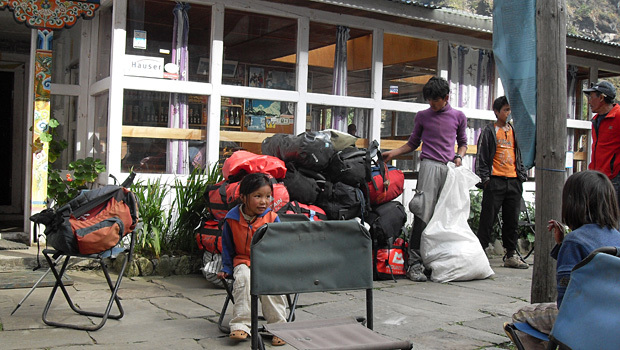 Since the word hotel has, therefore, been pre-empted, Nepalis use the word lodge for a sleeping place or inn. Thus in the hills of Nepal a hotel has food, but may not provide a place to sleep, while a lodge always offers accommodation. Many innkeepers specify the services they provide by calling their establishments Hotel & Lodge. In reality you can almost always find food and some kind of accommodation at any trailside establishment. If you are in a particularly remote region where there are no teahouses, you can often arrange food and accommodation in private homes. You could also end up in a home if your guide has friends in a particular village, if someone is just opening a new lodge or in an emergency when you cannot make it to the next hotel. Though it may appear that you are a guest, the householder always expects that you will pay for your food and lodging. Prices are flexible in such situations, but usually the owner of the house will quote a fair price in the morning when you depart. They will, however, be shy and you will have to ask how much. In a private home, you will probably have to wait until everyone else decides to go to sleep before you can roll out your sleeping bag. Be sure to find out where the toilet facilities are, if they exist. Don’t dispose of garbage of any kind in the cooking fire. If there is a religious statue or altar in the room, arrange your bed so that your feet do not point in its direction when you sleep. Beware of low doorways when you enter a house. It is said that a low doorway teaches humility, but more often it can result in a nasty bang on the head.